LOVE IT! Why didn’t I think of doing that? 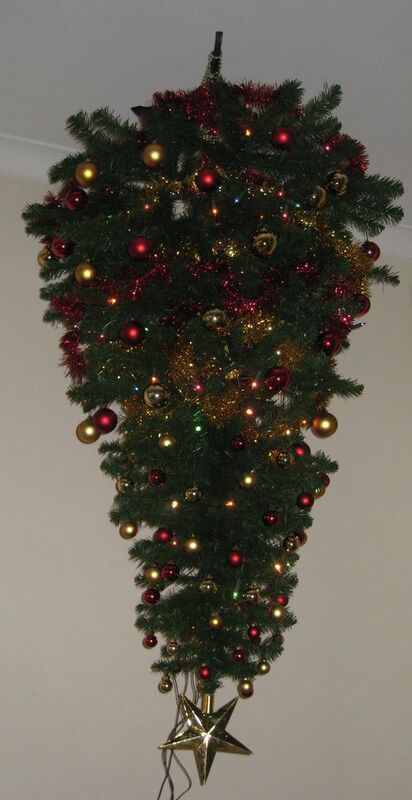 I love the upside down tree idea… more room for presents. love the new header by the way! Neat idea! I just ignore Christmas m’self. Not a card, not a present, not a drink. Well, a few pints of vodka but I drink that most days. Seerusly tho’, Xmas is so boring why bother with it? No-one ever persecutes me for ignoring it. From the northern hemisphere, the tree looks right. @novparl, I was going to ignore it as well this year, wasn’t going to bother with a tree or decorations, but my friends wanted me to do my traditional Christmas Champagne and Croissant Breakfast. So not to disappoint them I put up the tree – they are in for a shock when they see it!! Champagne & croissants? Who says Ozzies are Philistines! Next year, we’re doing the festivus pole. Must less fuss.